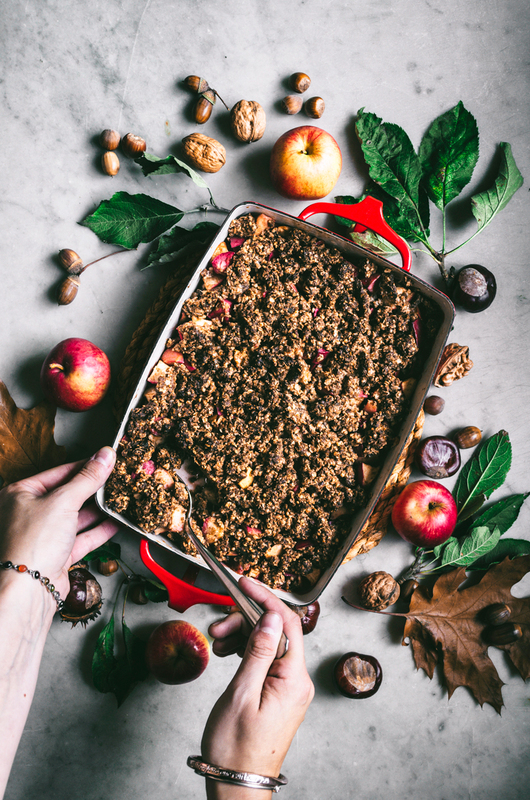 This date sweetened, gluten free & vegan hazelnut apple crumble is all about fall, with an oat and hazelnut topping for sweet in season apples. 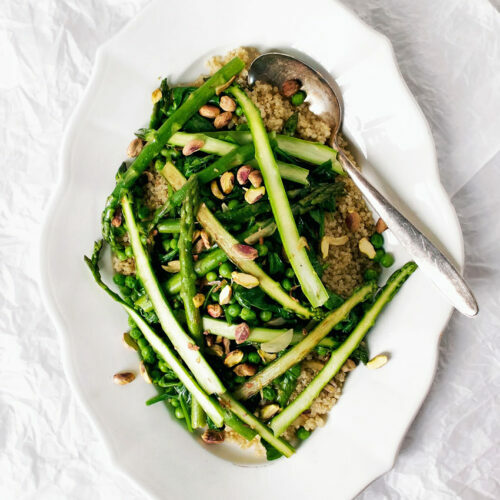 Using rich hazelnut butter in the crumble takes this recipe over the top. 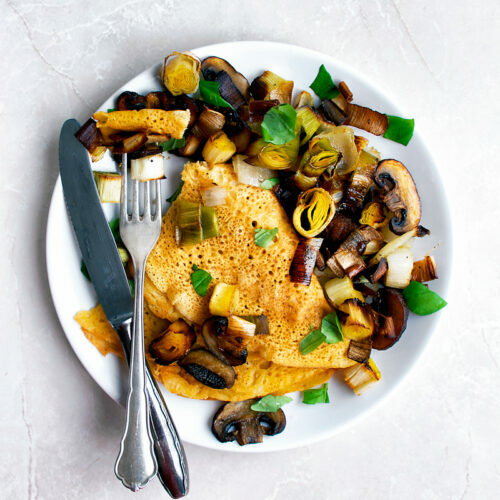 This easy, healthy dish can be eaten for breakfast or dessert. I spent this past weekend with a friend, cooking, baking, and taking pictures together before she starts university again next week. She has no experience with food styling or photography, but makes suggestions and recommendations that I would never think of. My friend, Svenny, is a musician so she is an artist, but doesn’t usually work with visual art – she should! 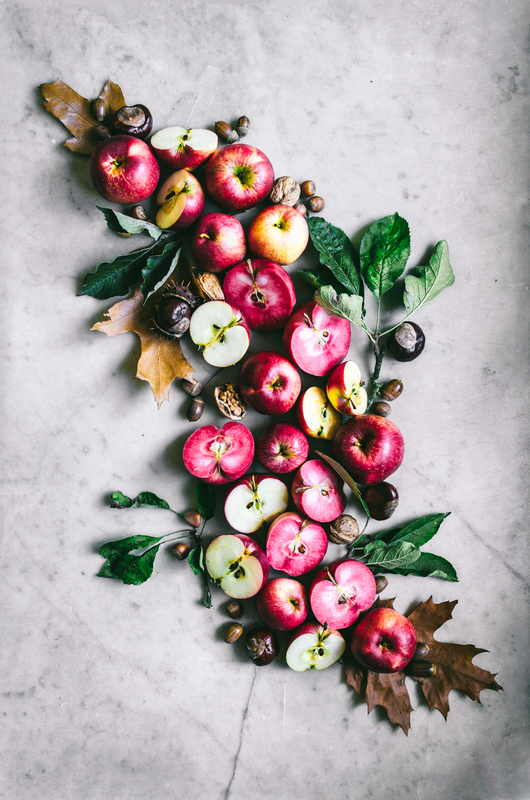 For this shoot, I started with an apple photo with just apples and some apple leaves and was planning to leave it at that, even though a hazelnut apple crumble is a very seasonally inspired recipe. 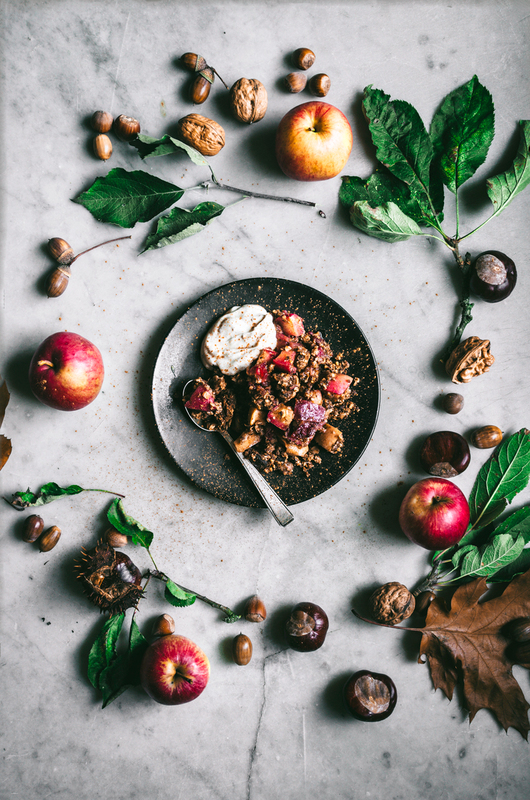 She brought in oak leaves and nuts from around the garden to create a Waldorf-inspired seasonal image that told a much more interesting story than the one I had planned. You can see the end result below. I took about 50 photos this weekend, and shot close to 20 individual recipes. Some for this blog, some for an ongoing contract job or my stock photography profile. Svenny not only made the process a lot more fun, but helped to create a much better end result for every image. She is also an endlessly patient hand model. I’m lucky that she has been happy to help over the past year or so and then just eat everything I make! You can see here in this sweet potato curry pie and for these chocolate orange energy bites, too. I haven’t quite figured out how to include myself in a lot of photos and my hands always look awful. If you see hands somewhere they are most likely hers, because Graham is a very grouchy model. So what I’m getting at, here, is that if you have the opportunity to include someone else in your work – a friend, a family member, a colleague or intern – you’ll probably create something you didn’t expect or plan. A different perspective is not only deeply valuable in itself, especially for people who tend to work alone, but can help to open your eyes to alternate possibilities with your work. Because I so often work alone, bringing friends into the process is both more fun and almost always more productive. Even for people who work remotely and may not be near enough to people to do this, you can replicate the process through online connections. I talk to Heidi from The Simple Green literally every day to bounce ideas off each other or just to chat, and that friendship is so valuable in an otherwise very isolating line of work. 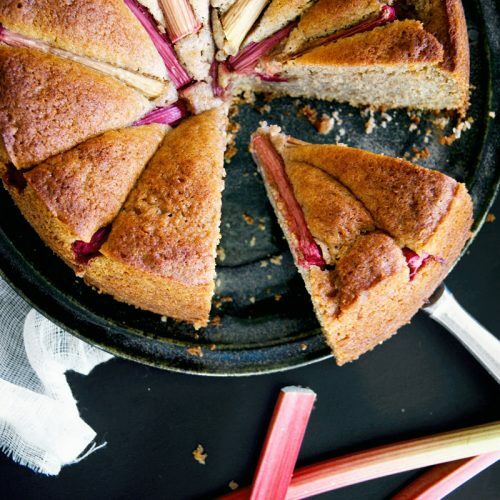 A bit surprisingly, there aren’t a pile of apple recipes on my site. I’ve always had this idea that crumbles and crisps are too simple to share, but especially after moving to Germany it’s been in the back of my mind that I should share a recipe for one. This vegan, gluten free, & date sweetened hazelnut apple crumble is the best thing that’s come out of my kitchen in a while. And it only needs 10 ingredients! Okay so yes it’s pretty free-from and that maybe turns some people off recipes. BUT I’m 100% positive that everyone who doesn’t have a hazelnut allergy would be all over this. Nut butters are the vegan cook’s secret weapon. If you do have an allergy, I’m pretty sure this would work with sunflower seed butter/flour, but it might not be sweet enough, so no guarantees. The hazelnut/apple/spice combo is pretty amazing and you can also make your own hazelnut butter. 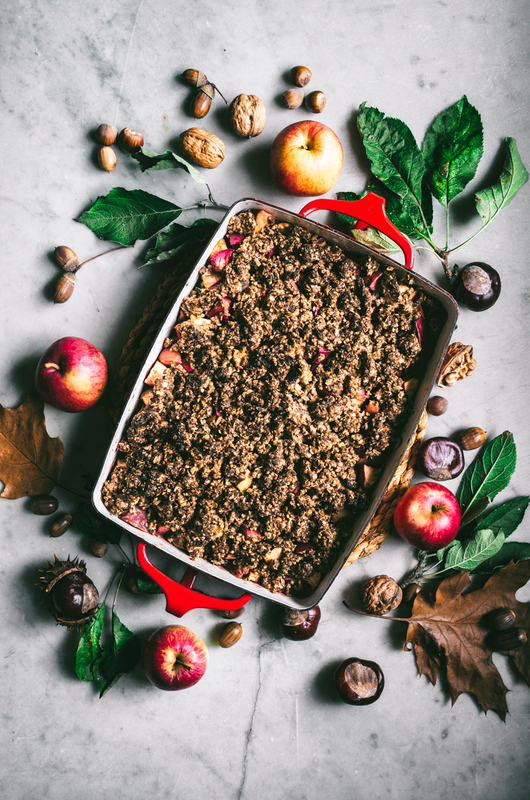 A few notes about the crumble – the topping can burn quite quickly if you leave it in the oven too long, as dates have a tendency to do that, so keep an eye on it. Choose the best tasting apples you can get! At this time of year in the northern hemisphere apples are delicious, cheap, and readily available. If you can get them for free, then even better. Almonds would make the best substitute for hazelnuts here but if you can use hazelnut butter and flour, absolutely do. I can’t tell you how well leftovers will hold up, because it’s never lasted more than a day. I think they’d be fine, though, and you have to heat it up and eat some for breakfast if you do have some left. When we did these photos I just plonked the pan down on the table and everyone took spoonfuls as they passed by. 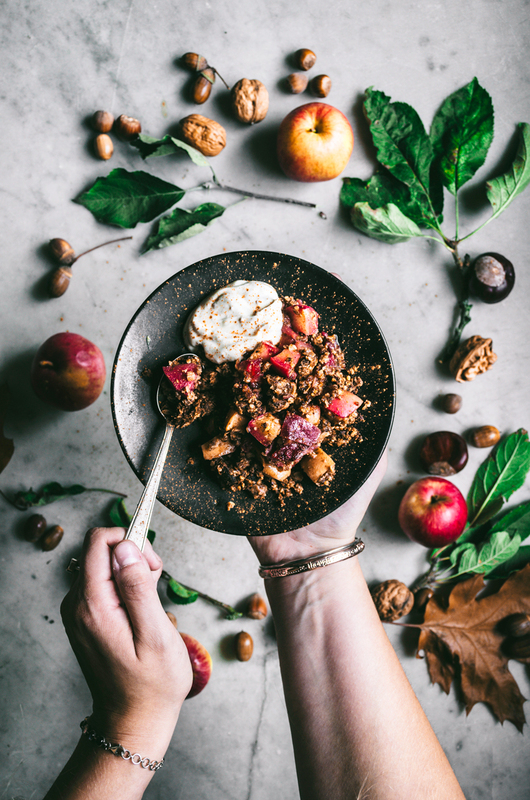 Serve up this hazelnut apple crumble any day of the week, or bring it out for Thanksgiving or another big dinner. It’s so easy but everyone loves it, and you can prep ahead of time or reheat it right before serving. So good. 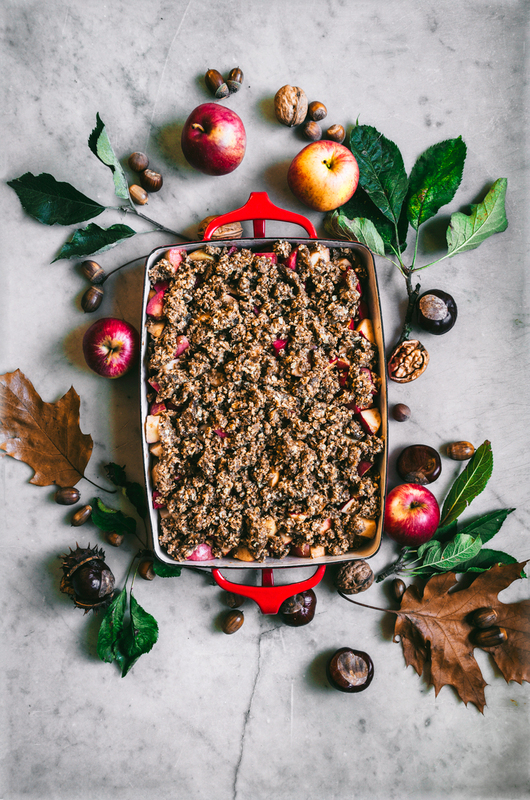 This date sweetened, gluten free & vegan hazelnut apple crumble is all about fall, with an oat and hazelnut topping for sweet in season apples. This easy, healthy crumble can be eaten for breakfast or dessert. Preheat the oven to 180C / 350F and set aside a baking dish (mine was about 25cm / 10in by 18cm / 7in). Core and dice the apples and place them into the baking dish. Add the maple syrup and spices, and mix until the apples are coated. To make the crumble, mix the hazelnut meal, oats, and cinnamon in a bowl. Add the dates, coconut oil, and hazelnut butter, and use your hands to mix until a crumble forms. Top the apples with an even layer of crumble, and bake for 40-45 minutes, or until the apples are cooked and the topping is golden. 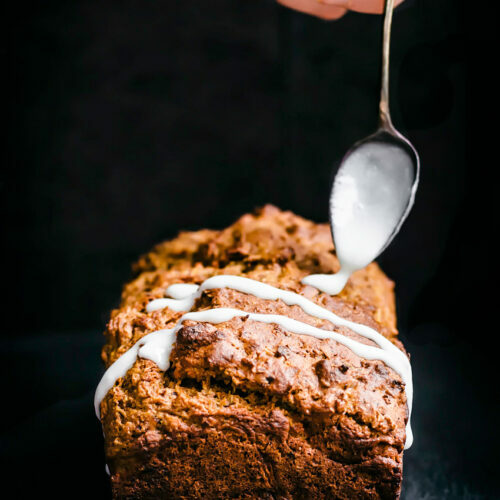 Serve warm with a little nondairy yogurt or ice cream. • If the apples you use are very sweet, add the juice of half a lemon to the apple mixture. I suggest using more tart apples if you can. • I either mash dates with a fork if they're soft (less dishes) or blend them up in my food processor. If your dates are too hard, soak them in hot water for 30 minutes beforehand. * I always use fresh nutmeg and grate it with a microplane. If you use pre-ground nutmeg, add 1/4 teaspoon instead. ** Quick cook oats are better here - if you don't have any, just pulse rolled oats a few times in a food processor to chop them up a bit.